Meet the Auto-B-Good gang, a bunch of friendly cars who travel through life getting into all sorts of crazy adventures! Each animated DVD features six fun episodes that teach a variety of important character values. Approximately 60 minutes each. 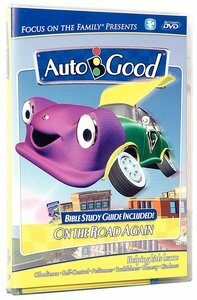 About "On the Road Again (#04 in Auto B Good Dvd Series)"
Your Auto-B-Good pals will venture into places they've never been, and along the way learn valuable life lessons. The Bible's roadmap allows these cars to operate on all cylinders and discover their place in the world. So hang on, because it's going to be a wild, fun ride!